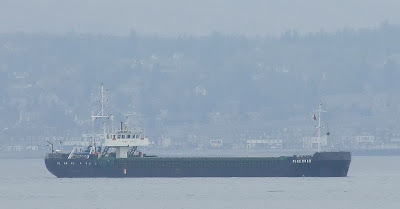 The Panamanian-flagged coaster MINERVA II, loaded with a cargo of scrap metal for the Portuguese port of Leixoes, sailed from the Lobnitz Basin at Renfrew on Wednesday afternoon. However, just upstream of Dumbarton, she lost engine power and ended up going aground, being later refloated and towed clear by Clyde Marine's tug BATTLER. MINERVA II was later berthed at Ocean Terminal, where she was inspected by MCA surveyors to assess any damage. She is now anchored off Greenock. Thanks Robert - spam comment now gone!